The Super Nintendo Entertainment System was released in the United States twenty-five years ago today. August 23 1991 was truly a game-changer in the history of video games. Just as Sega was beginning to dominate the gaming market with the Genesis and it’s 16-bit blast processing powers, Nintendo follows-up the NES with its first successor, the Super NES. In hindsight, the Super Nintendo may seem like the smallest leap forward for a Nintendo console (except maybe the GameCube). Whereas the Nintendo 64 would bring things to the world of three-dimensions, and the Wii and Wii U emphasized innovation over technical power, the Super Nintendo might just seem like a 16-bit update of the NES. But its legacy proves that that couldn’t be further from the truth. First and foremost, the SNES is best remembered for its games. As a video game console, it would make sense for that to be the key ingredient, and with Nintendo going toe-to-toe with Sega, they pulled out all the stops. Nintendo’s key franchises from the NES, such as Mario, Zelda and Metroid, made the transition to the Super Nintendo with defining installments. The Legend of Zelda: A Link to the Past proved so influential that it became the blueprint for every Zelda thereafter, while Super Metroid helped create a whole new genre. Mario not only refined the formula he established on the NES with Super Mario World, but now he was properly transitioning to other genres with the likes of Super Mario Kart and Super Mario RPG, the former of which also created a genre of its own, while the latter is still one of the most beloved RPGs of all time. Donkey Kong, who had been dormant since the arcade days, found a whole new life in the form of Donkey Kong Country, which spawned an entire trilogy of classics on the SNES and were ultimately responsible for the SNES beating the Sega Genesis in sales. The SNES introduced the world to Star Fox and F-Zero, while introducing western audiences to the EarthBound series. And of course the SNES also marked the debut of one of Nintendo’s most beloved characters, Yoshi, who first appeared in Super Mario World and would later star in Yoshi’s Island, one of the system’s finest games. On top of that, the SNES still boasts the finest lineup of third-party titles in Nintendo’s history: Chrono Trigger, Final Fantasy, Secret of Mana, Mega Man X, Street Fighter 2, Super Castlevania IV, the list goes on and on. Perhaps the best part is how well all these games hold up. NES games are fun, but you can tell they’re retro. N64 games look prototypical (as they were treading new territory), and not all of the games hold up so well. But SNES games still look clean and colorful, and still play wonderfully. Speaking of how the games play, the SNES still has the best video game controller ever. By adding two more buttons on the front of the controller, as well as shoulder buttons, it is still the standard for video game controller designs! The Playstation controller, the Xbox controllers, and even subsequent Nintendo consoles like the GameCube and Wii U have more or less replicated the SNES’ controller design. Simply put, the SNES not only built on everything the NES started, but also brought so much more to the world of video games. The timeless games, great hardware, better storytelling, more varied genres, phenomenal soundtracks, it’s easy to see how the influence of the Super Nintendo is still felt in today’s gaming world. Let’s all take a moment to congratulate the SNES for being the greatest video game console for over twenty-five years. Happy birthday, you wonderful, gray and purple box, you! 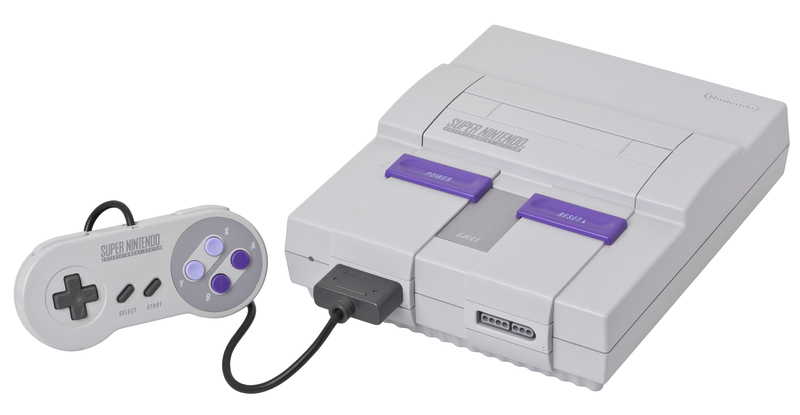 Happy Birthday Super Nintendo! One of my favorite systems! Oh this is great to know! I missed out on the SNES entirely as a kid and I’m finally now able to buy and play games for the system. It is like a little RPG machine, which is my favourite kind of machine! I’m happy it is being remembered for what an excellent revolution it brought about back in the early 90s and that people are still fond of all its gems. My favourite console, even now. The greatest console of all time without a drop of doubt (apologies to the Playstation 2 and Nintendo DS). It is amazing how utterly timeless its classics are. Happy birthday to the SNES! While I never owned this system, it will always deserve respect in the gaming industry for setting standards and having some of (What’s considered) the best games on there. One of the better systems out there for sure, hopefully Nintendo will aim to make a SNES mini in the future with a more ambitious collection of games than that of the NES. The SNES… the greatest system ever made. Next Next post: The Wizard Dojo/Miketendo 64 Alliance!